The Departure of the Pilgrim Fathers from Plymouth. Modern fore-edge painting by Martin Frost. Martin Frost, the modern master of fore-edge painting, has commemorated Thanksgiving Day with a new creation depicting the Pilgrims' exodus from Plymouth, England September 6, 1620 to establish Plymouth Colony in Massachusetts, America. It's a feast that doesn't require that you afterward loosen your belt, lie down, and contemplate the caloric surplus with bittersweet indigestion and a Pepto-Bismol chaser. LONGFELLOW Henry Wadsworth. Poetical Works. London: Frederick Warne and Co., 1893. Octavo (190 x 140mm). 630 pp. 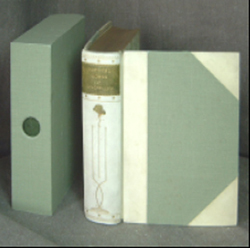 Contemporary binding in half vellum by John Ramage with later cloth boards. Very nice Art Nouveau style spine decoration, marbled endpapers, all edges gilt. Some foxing to prelims otherwise in very good condition. Housed in a matching thumbhole slipcase. 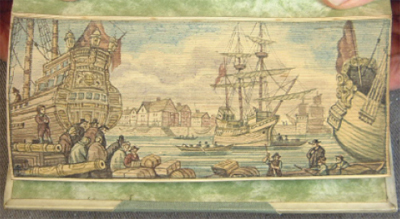 Featuring a later fore-edge painting of the departure of the Pilgrim Fathers from Plymouth monogrammed by Martin Frost, and with authentication ticket. Image courtesy of Martin Frost, currently offering this item, with our thanks. View Martin Frost's fore-edge painting gallery here.